While Moscow now has Europe's biggest stock of shopping center retail space, the market still has great growth potential. Moscow has overtaken Paris to become the European capital with the most shopping center space, even as a recession forces Russians to cut back on consumer spending. In the first half of this year Moscow had more than 4.53 million square meters of shopping center retail space, compared with 4.5 million square meters in Paris, according to a report by real estate consultancy Jones Lang LaSalle (JLL). But the boom in Moscow mall building will be followed by a slump as Russia's economic downturn catches up with the sector, experts told The Moscow Times. The new economic reality will also likely end a trend of building massive mega-malls in Moscow and spur the growth of smaller shopping centers that are cheaper to build and run, they said. Large malls have hogged investors' attention for long enough, according to Olesya Dzyuba, head of research at real estate firm Colliers International Russia. 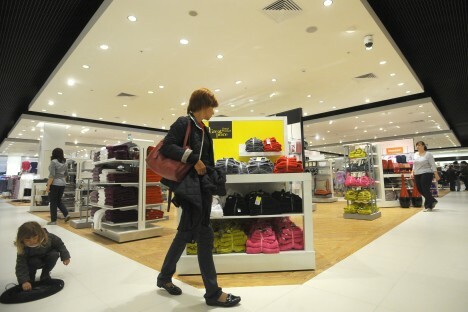 "Small format shopping malls have great potential on the Moscow market since there are not enough of them," she said. Six shopping centers have already opened in Moscow this year with a total area of 343,000 square meters, according to data from Colliers International. "It's an absolute record," Dzyuba said. But the new space is coming online just as an economic crisis is hitting Russians' spending power. Russia's economy is expected to shrink by around 3 percent this year under pressure from sanctions imposed by the United States and European Union over the Ukraine crisis and the fallen price of oil, Russia's main export. With incomes falling sharply, Russians spent 7.7 percent less on consumer purchases in the first five months of this year than in the same period in 2014, according to official data from the Rosstat statistics service. The mega-malls now opening in Moscow were begun long before the current crisis, when retailers were confident of economic growth and were developing rapidly. But the recession is causing a shift in attitudes that will temper enthusiasm for new mall projects, said Nikolai Kazansky, managing partner of Colliers International Russia. "Since consumer demand isn't growing, retailers are no longer enthusiastic about developing their chains in Russia," he said. Vacancy rates in new shopping malls are now around 6-8 percent, compared with 3 percent before the crisis, according to estimates by JLL. Many malls have slashed rent rates, some by up to 50 percent, to keep retailers. According to Denis Sokolov, head of research at real estate firm Cushman & Wakefield Russia, only one or two new shopping malls will open next year. Colliers International is more optimistic, predicting that 500,000 square meters of new retail space will come online in 2016 — the same as this year — but that 2017 will see a sharp slowdown. According to JLL data, investment in Moscow retail real estate amounted to $2.2 billion in 2013, of which about 60 percent was foreign capital. Last year, only $350 million was invested, all from Russian sources. The economic crisis will reduce not only the number of new shopping centers in Moscow in the near future, but also their size. Despite being a popular European trend, small format shopping centers are not common in Russia. With fast economic growth producing huge rises in annual consumer spending, the last decade saw developers build massive shopping centers with an area of 100,000 square meters or more to quickly supply retail space to the market. Capping that trend, Moscow's mega-mall Avia Park, which opened last year at 228,500 square meters, became Europe's biggest shopping center. But with Russia's economy predicted to emerge slowly from the current crisis, the logic will change. Smaller shopping centers that are closer to residential areas will be easier to fill than huge malls, said Tatyana Kluchinskaya, head of the retail department at real estate consultancy Jones Lang LaSalle Russia. Cushman & Wakefield's Sokolov added that developers will find it harder to raise financing during the crisis for large shopping centers, which on average require about $500 million. While Moscow now has Europe's biggest stock of shopping center retail space, the market still has great growth potential. At more than 12 million people, Moscow has an official population five times larger than that of Paris, which has around 2.25 million residents within its city limits. "In Moscow we have 434 square meters of shopping centre space per 1,000 residents. In big European cities the volume of shopping center retail space per 1,000 residents is 600-700 meters," Dzyuba said.